We frequently encounter documents sent in by our clients, with images of 3D CAD models and screen captures of working 3D CAD models. IP professionals often do not ask inventors for these sophisticated 3D files seen in their PDF because they cannot open them. Staff designers at Legal Advantage have practical experience working with 3D modeling, and because of our various backgrounds some are more familiar with manufacturing ready engineering CAD, other are artists with years of experience with surface modeling such as Maya and Rhino, and our Industrial Designers have hybrid skills with both. Simply put we have the technical background and software to handle any type of file thrown our way. While we gladly accept our clients PDF documents, we can open those 3D files, and send you back customized views, internal mechanics, exploded views, or compact 3D files that you could manipulate with your existing software. We prefer 3d files because we can generate true isometric views of the matter at hand, which we will use as a basis for our drawings. These exact views may have not been provided by your client. True 3D files can be manipulated to dramatically speed up drafting and increase accuracy. 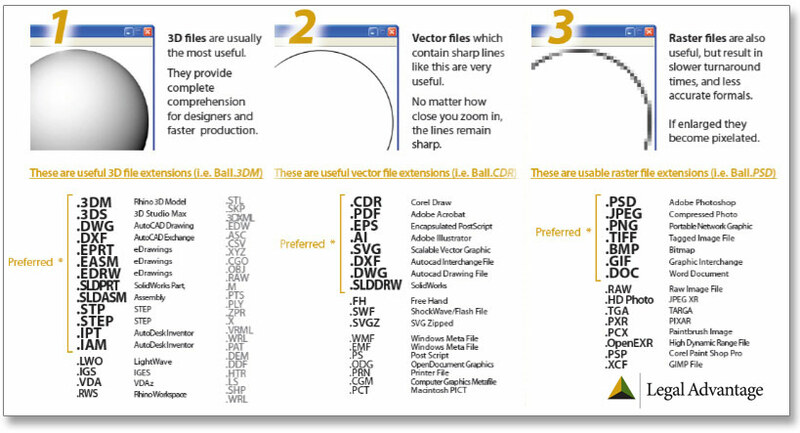 You may be familiar with some of these file types, such as a 3d AutoCAD file or even STEP files. Follow the link to see the types of files we work with on a regular basis, and what you can request from your inventor for your next matter. Read more on File Format Tips on our Design Patent page.